This year I ordered a new bike after a couple of seasons aboard the same vessel. I have to admit that I spoiled myself. Top shelf carbon frame, dialed suspension, trendy wheel size, 11 speed drivetrain, four piston brakes… the works. While the bike was in transit I was bummed to hear that my shiny, expensive new brakes were already second best. A shinier, lighter and more powerful brakeset had just been released, ultimately to replace the brakes I hadn’t even tried yet. When will the madness stop? That same day, while looking for new handlebars (to compensate for lack of skill) the bike shop I was dealing with told me to check out the new 35mm components that were set to drop. “What!? My brakes, bars and stem are all outdated?” Madness I tell you. The Straightshot gang decided to investigate this new standard. We wanted to know what had motivated the increased diameter. Was it driven by weight, strength, stiffness or to take advantage of yuppies with credit cards? All of the above? Fortunately, forward thinking companies such as Chromag, Raceface and Easton were all willing to let us pick their brains. Why 35mm? Engineering or marketing? EASTON: Purely Engineering. The gravity market is going wider and wider with handlebars. Some riders are going as wide as 800mm. We wanted to fill that need, but we weren’t willing to compromise the strength, stiffness or weight of our class-leading 31.8mm Havoc handlebar (which measures 750mm wide). CHROMAG: It is relevant. We saw physical benefits here and that’s why we are using it. What are the advantages? Will these advantages be noticeable on the trail? EASTON: All of our 35 bars are wider and lighter than their 31.8 counterparts without losing stiffness. That translates into better control on the bike with less arm fatigue. This is something that we feel is absolutely noticeable on the trail. CHROMAG: In our case, 35mm made it realistic to make a wider bar out of Carbon that would be used at the most demanding levels. RACEFACE: The main advantage are weight savings, especially for Alu bars. Our new Atlas 800mm bar is 40g lighter than the old 785mm 31.8, with no sacrifice in strength. Does the motivation for the increase in diameter to 35mm come from the bar or the stem? EASTON: Bar, most of the stems are the same weight, maybe a little lighter but their performance is close to the same. CHROMAG: It’s mostly about the bar. 35mm allows us to make a carbon bar that is as strong or stronger than aluminum bars and we can reduce the weight of the bar-stem combination significantly. RACEFACE: Bar, this is where the biggest weight savings can be found. It’s difficult to save weight on stems moving from 31.8 to 35 as your stem has to be larger and it isn’t a thin walled object like a bar. Although the new Atlas DM stem is over 30g lighter than the old 31.8 design, much of this comes from the new 2 piece design, not the switch to 35. Is 35mm optimal, or can we expect bigger diameters in the future—much like the progression from 25.4–31.8mm? EASTON: It’s about balancing the parts on the bike. As the frame / fork / wheels get stronger the cockpit needs to also be stronger. Bikes can do more today than 5-10 years ago, a 6” bike can do more than most older DH bikes at close to ½ the weight. As the other parts of the bike get stronger you need to balance the system. I hear people say why “35mm, I never broke a 25.4 bar”. If they are purchasing a replacement bar for their 14 year old Klein Mantra they are correct, a 35 bar is not needed. However if you are looking at a bar for a bike made in the past 5 year or the next 10 years 35 is the correct platform because it has the strength needed to balance the bike. 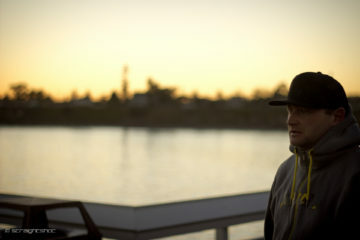 CHROMAG: It is when considering our current list of goals and priorities. But these things can change. New standards in related components, new materials and fabrication methods could change everything. RACEFACE: We don’t expect to see another dia jump. As you go to a larger diameter bar you can reduce the wall thickness, but there is only so thin you can go before you run into durability issues. Is the move to 35mm about weight, durability or feel/stiffness? CHROMAG: We entered 35mm to make a lighter bar out of carbon. RACEFACE: Weight. There has been a lot of talk around increasing stiffness moving to 35mm. But we’ve never had any problem with the flex/feel of our 31.8 bars and moving to 35 our goal has been to maintain the tried and trusted feel of our bars. Bars which are too stiff can lead to faster hand fatigue. How stiff is too stiff? EASTON: We look to tune our bars to have about the same deflection regardless of width. For example if you fixture the 31.8 x 750 bar and 35×800 bar and hung the same weight from the end the deflection would be close to the same. So the 800 bar is stiffer, however to the rider on the bike 800 bar and 750 bar will be about the same. We look to tune our bar have the same ride at the intended width. There are stiffer bars on the market and less stiff, we have a long history of making bars and lots of rider feedback so we are able to use that wealth of knowledge to make a bar we feel to be in the sweet spot. CHROMAG: At this point we are very satisfied with the balance of control vs compliance in our 35mm carbon. We’ve tested some alloy counterparts that don’t feel as good. RACEFACE: This comes down to personal preference and will vary from bike to bike. Our Alu bars are stiffer than our Carbon bars. How strong (in real world terms) are the bars? i.e. 200lb rider dropping 15′ to flat. What is the longevity of a modern carbon bar? Do they still need to be replaced after every season? EASTON: Our new Havoc 35 carbon bar is the strongest bar we have ever produced or tested. 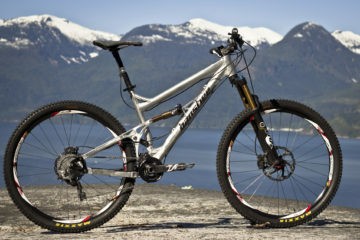 To compare it to another bar we made for a long time, the Monkey Lite DH, the new Havoc 35 is around twice as strong. That is not to say the Monkey Lite bar was weak because it was not, at the time that was the strongest bar on the market. However as I stated above times have changed and bikes have changed. We know we need to keep increasing strength to keep ahead of loads riders can put into a bar. If you don’t damage a carbon bar it will last a very long time, I would say 6-10 years depending on your ridding style. If you crash the bar should be inspected and if the bar is damaged it needs to be replaced (that goes for both aluminum and carbon). 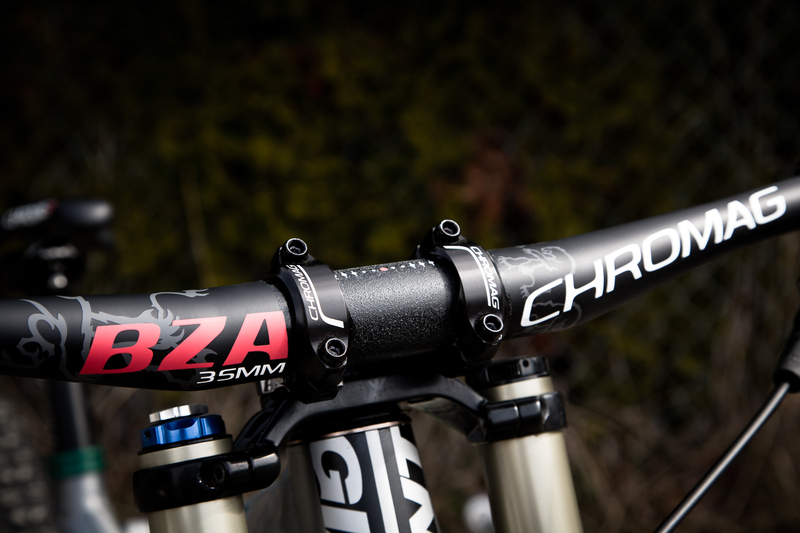 CHROMAG: In testing our BZA bars are outperforming any 31.8 alloy bar when it comes to both pure impact strength or long term fatigue. we take a cautious approach when it comes to recommending long term usage but I can tell you that our bars have withstood many times what a typical alloy bar would at fatigue testing. RACEFACE: It’s very difficult to quantify real world bar loadings like that as there are so many variables to consider which will vary massively from rider to rider. Frame strength and stiffness, suspension setup, wheels, tire pressure, position on the bike the list goes on, these all interact to absorb different amounts of energy. Did the increase in bar width lead to the increased diameter? EASTON: Yes, see Question 1. CHROMAG: It is related, yes. Frames & components such as forks & (carbon) wheels are getting stiffer. Was 31.8mm the weak link? EASTON: No, not the weak link but to ensure it was not the weak link it would need to get heavier to increase strength. Or the better solution increase diameter, that way weight could be decreased. CHROMAG: Not entirely but again for us, moving to 35mm is about combining downhill width with carbon to achieve a lighter weight bar that has the impact strength we wanted. RACEFACE: No. We’re interested in saving weight, not increasing stiffness on our cockpit. Will carbon bars ever be the norm on all mountain bikes? Can we expect further cost reductions? EASTON: The majority of the cost of carbon bar is the labor to lay them up. Until we have a more automated process to produce carbon parts the price will hold about the same. CHROMAG: I’d say they are rapidly approaching the norm now. I doubt there will be significant cost reductions for quality products. We are seeing a proliferation in people making carbon products and some of this stuff is not great quality. We may see more dodgy product at lower prices but otherwise, I don’t think the costs of good carbon products will drop. RACEFACE: This all come down to cost. Carbon bars are much more expensive to make than Alu bars. Our carbon handlebars are all individually laid up by hand. If there are advances in automated carbon layup manufacturing process its feasible that the cost of carbon bars will drop in the future. If Carbon bar costs come down to around Alu bar costs then I think they will become the norm. EASTON: The limiting factor with the 35 platform is the bar width. By that I mean having a bar wide enough to take full advantage of the 35 diameter. If we were still making 580mm bar 35 would not work. However now that almost all mountain bar are over 700mm 35 is a perfect platform. CHROMAG: When you are designing something like a stem, you have to accommodate all the existing conditions. The reach you want, the diameter of the steerer—and the bar, the hardware etc. All these things could be limitations but a great design is all about considering these conditions, and the functional, performance, and even aesthetic goals of the projects and blending it all into the best product possible. RACEFACE: There are many factors that all have to be considered together and the constraints vary depending on the material Carbon/Alu. Moto bars are often over 800mm wide, yet their clamp diameter ranges from just 22.2 to 28.6mm. Why is such a wide diameter bar necessary on a mountain bike? EASTON: The clamp position of those bar is not the center but a double clap, and often times a cross bar. As stated above the Easton 35 moto bar was 800mm wide and much stronger, stiffer, and lighter, than the 22.0 & 28.6 options. We could make an 800mm handlebar with a 22mm clamp, but it would be much heavier and most mountain bike riders that we know don’t want that kind of weight penalty. CHROMAG: They did make 35mm moto bars for a while but it didn’t take. I can’t say the absolute reason for this. Perhaps it was simply that the market didn’t subscribe, or the pioneers of the standard didn’t tell a compelling story. 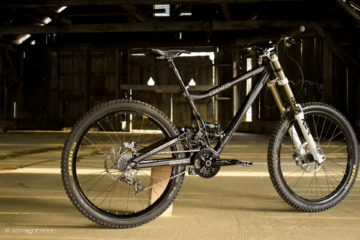 With a mountain bike, you are looking at a machine that is around 20% of your body weight. It’s not the same ratio with Dirt bikes… and they have this thing called a motor. 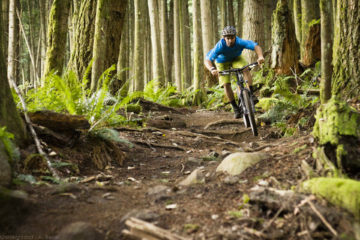 Mountain bikers are counting grams one at a time. RACEFACE: Moto is much less weight obsessed than MTB, so gram saving are far less important. The parallels between each company’s thoughts about the 35mm standard have led us to believe that the new diameter is more than marketing. The dissimilarities have left us believing that the madness might continue. If you’re a rider looking for greater carbon bar width, interested in shaving a few grams or want longer lifespan from your components, the 35mm diameter might be worth your while. If you’re looking for the final bar revision, you might want to wait. It seems that the answers have prompted new questions. Can the average rider tell the difference between 31.8mm and 35mm cockpits in a blind test? Should I finally donate my old 25.8mm stem? The answer to the first question remains to be seen. The answer to the second is an overwhelming ‘no’… I love that stem. Sorry dear. A huge thanks for Easton, Chromag and Raceface for their time to help us with our curiosities to this new bar and stem standard. Chromag images by Stephen Li, Easton images courtesy of Easton.